In a collaboration with local residents and KQED, Detour, a startup offering audio walking tours of 11 San Francisco neighborhoods launched its Mission District tour yesterday. The Mission’s tour offers insight into the lives of six locals and newcomers who share a love for the neighborhood but grapple with the question of belonging. The city package sells for $24.99, and individual tours can be purchased through the app for $4.99. The company has already rolled out tours in Austin and New York City, as well as in Europe and North Africa. Partnering with KQED, Mason said he hoped to show the realities of the changing neighborhood and its residents. “[This tour] is getting closer than any other way of walking inches of somebody who had a different experience than you,” said Mason. Detour also partnered with community leader Roberto Hernandez and other local residents to provide historical context of the Mission while highlighting the impacts of gentrification. While most audio tours generally target tourists, producers of the Mission Detour want the walk to appeal to newcomers and longtime residents alike. The location-aware app uses GPS technology to sync the tour’s audio component to the user’s location. The Mission Detour plants users — smartphones in hand — underneath a mural at the south side of 24th Street BART plaza, where they are greeted by Hernandez’ voice via headphones. Without actually meeting the Fedora-sporting “mayor of the Mission,” they can now learn about his years of working to preserve the neighborhood in which he was born and raised. Giving outsiders those inside perspectives is why Mission Detour is important, according its producer, KQED correspondent Julia Scott. 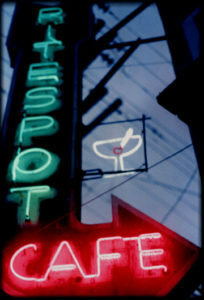 “Sometimes these groups of [visitors and locals] don’t hear from each other. Especially not in the same 45 minutes,” she said. Scott said she spent the better part of the tour’s six-month production searching for a balanced roster of local narrators that includes two tech workers. Once the initial disorientation and the slight awkwardness of following the instructions of a bodiless voice subsides, users of the tour may find themselves surprised by details that go unnoticed, even by natives. Along 24th Street, Hernandez casually invites Detour users to enter local businesses and alleyways lined with murals. 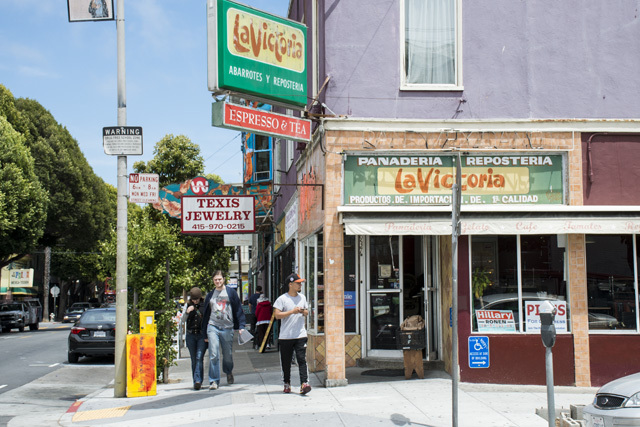 One stop is La Victoria bakery at 24th and Alabama streets, which with some 65 years in business, has survived the skyrocketing rents that have shuttered other family-owned businesses on the street. Here, users are introduced to the voice of owner Jaime Maldonado, who explains that a business move to adapt to the changes by serving croissants alongside traditional Mexican pastries, is what allowed his business to continue thriving. Just a few blocks up, tech workers Karina van Shaardenburg and Tim Hwang invite users to stop at Haus, a “popular tech cafe” seen by some as a symbol of gentrification. Both have lived in the Mission for some time, yet their take on the changes catalyzed by gentrification differ slightly.